Portable air conditioners offer many benefits over window or central air conditioning units. These units can be used in apartment buildings that prohibit protruding units or on camping trips during those summer months. However, with so many technical variables to take into consideration, finding the best portable airconditioner for you can seem like a rather daunting task. Hence, below, you'll find a review of five portable air conditioners to help you determine what's the best for you. 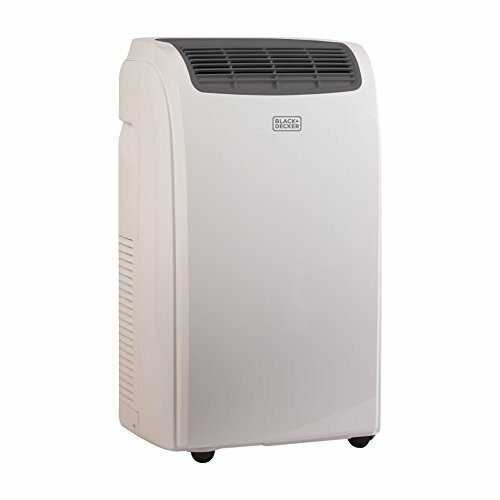 Emerson Quiet Kool EAPC14RD1 Portable Air Conditioner with Remote Control for Rooms up to 350-Sq. 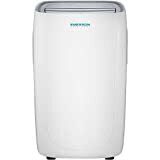 Ft.
Black and Decker is a well-established brand in the world of DIY hardware and often unthought of when considering portable air conditioners. It's for this expertise that we can't rule out their obvious knowhow in mechanical engineering; hence, we've included this unit on our list. Not only that, but this air conditioner also has unique yet simple features. 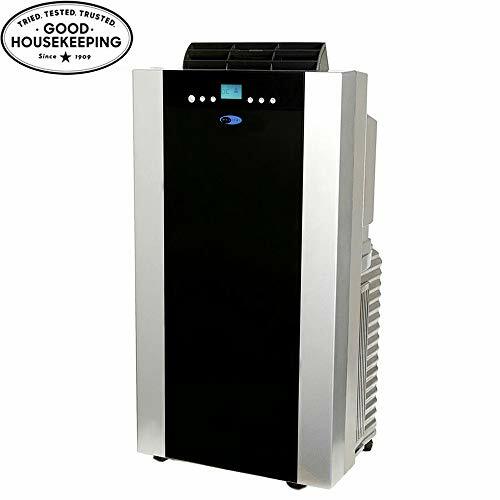 With a BTU rating of 10,000, the Black and Decker BPACT10WT is relatively powerful and can quickly and efficiently cool rooms with an area of up to 250 square feet without any issue. Thinking about comfort while you sleep, the company also incorporated a unique sleep mode that will allow the room temperature to rise by two degrees Fahrenheit over the duration of two hours after activation. This allows you to nod off without thinking about your energy bill. This unit is also extremely user-friendly. It includes a remote control so that you can adjust any of the temperature or fan speed settings from across the room. You're also provided with an easy-to-read digital display with a variety of status indicators. They've even included a simple slide-out filtration system that allows for easy cleaning and reduction of general maintenance times. This Black and Decker unit is approximately five inches slimmer than the industry standard. This allows it to be moved from room to room without difficulty and can be tucked away taking up very little floor space. 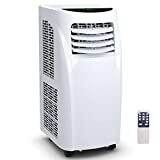 The Costway Portable Air Conditioner made it into our top five list since it offers all of the power and features of a high-end unit at an extremely affordable price. This unit was designed with both home and office use in mind. The Costway Portable Air Conditioner is the answer to affordable yet practical portable air conditioning needs. Again, with a 10,000 BTU rating, this unit can effectively and quickly cool a room that has a size of up to 250 square feet. This unit offers various useful operation modes including cooling, fan, sleep, and dehumidifying. Each of these functions can be used in parallel with the unit's 24-hour programmable timer, auto-condensate cycle, and warning indicators. This Costway AC also has an intelligent temperature sensor that allows the unit to adjust its operation status to accommodate any change in the temperature of the room. This is a great way to save energy and keep those electricity costs down. For your convenience, this unit has an easy-to-read LED screen, roller-caster wheels, and ergonomic carry handles. It also uses a two-way airflow deflection system to evenly circulate the air and also eliminate the chance of any hot spots in the room. The Emerson Quiet Cool EAPC14RD1 deserves a top spot in any portable air conditioner chart due to its effective cooling power. Emerson is widely known for producing top quality air conditioners, often backing their products with greater customer support. With a BTU rating of 14,000, this unit can cool areas with a size of up to 500 square feet quickly and effectively. This makes it a great unit for cooling large rooms or multiple rooms in a small apartment. 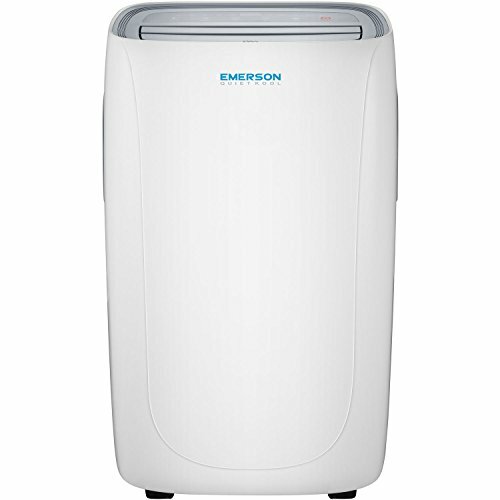 Not to focus solely on power, this Emerson Quiet Cool unit also hosts a range of great features. Users will benefit from a digital interface that allows for quick and easy programming, a remote control to alter these settings from across the room, and a single exhaust hose. This unit is also well covered in the event of an accident as the company offers a one-year labor warranty, a two-year parts warranty, and even a five-year compressor warranty. This really helps reassure customers of the quality of the product they're buying. This unit is also incredibly easy to install once you get it out of the box. It has a compact design, so it won't take up too much floor space and has a universal power source for added versatility. This unit is also great for the bedroom due to its quiet operation and a 24-hour timer that lets you pre-set the temperature delivering a comfortable sleeping and morning environment. The Whynter ARC-14S is a versatile, effective, and powerful portable air conditioner that also has a fresh modern look. Whynter only deal with refrigeration and air cooling, making them experts in their field. This is why you'll always find one of their products being recommended. 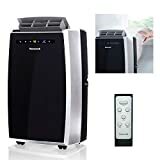 This portable air conditioner has a great modern style coupled with an easy-to-use digital interface, which allows anyone to quickly change the unit's settings hassle-free. The Whynter ARC-14S also uses a dual-hose system so that it can cool a room quickly and efficiently. Additionally, its 14,000 BTU power lets it effectively cool rooms up to 500 square feet in size. 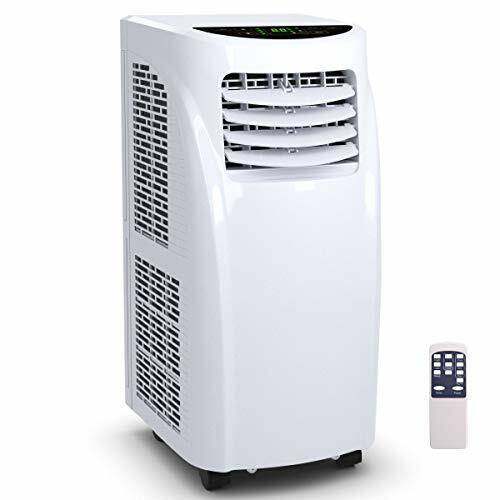 Being an eco-friendly portable air conditioner, the Whynter includes a washable pre-filter as well as an odor-neutralizing carbon filter to provide excellent air quality. The speed at which this unit can cool a room is great; thus, you can kick back, relax, and be cool within a few minutes. It also has a dehumidifier-only mode so that when it's humid but not necessarily hot, you can still create a nice relaxing atmosphere. Specifically, it can dehumidify a room at a rate of 101 pints per day. While this unit is great for its power and dehumidifying ability, it is a relatively large unit and takes up considerable space in the room. This doesn't make it ideal for anyone looking to move it outside of the home or for those really confined by their available space. Leading the way in the portable air conditioning market, the Honeywell MN12CES includes many sought-after features including a touchscreen display. This is often linked with its effective and powerful cooling capability. 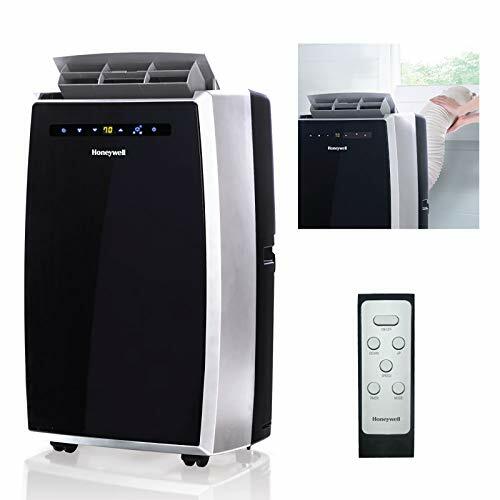 The Honeywell MN12CES is by far one of the best-designed portable air conditioners available today. 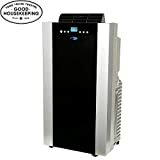 Don't let its looks fool you though; its 12,000 BTU rating makes it a powerful air conditioner that can easily cool a room up to 450 square feet in area. This makes it a great choice for living rooms or large bedrooms. This unit also offers a very intuitive touch screen display allowing for quick and easy setting changes. These settings allow the air conditioner to be used primarily as a cooling unit but also a dehumidifier for those sticky summer days. Likewise, it is also an all-purpose fan for when it begins to cool down, but you want to keep up a good level of air circulation. Its remote control lets you adjust all of these settings from across the room as well as alternating between the three different fan speeds. Users are also able to set an automatic shutoff timer, allowing for peace of mind when you leave the unit running as you go to bed. This also helps to keep the electricity bills down at the end of the month. For the environmentally conscious individual who still needs to stay cool during those long summer days, the Honeywell MN12CES uses the refrigerant R410A. This helps reduce the carbon emissions of the AC unit. Now that you have a better understanding of the important features to look for when buying your portable air conditioner, there are just a couple of tips to remember. First is don't pay for features that you won't use. Also, buy a unit that can effectively cool an area larger than the one you intend to use it in, and always check the energy efficiency rating. In conclusion, the Honeywell MN12CES wins our vote due to its intuitive touchscreen display, ease of use, and all-around functionality. With regards to the other options, they all provide a variety of benefits with some cases exceeding the Honeywell MN12CES in some areas but lacking elsewhere.